Where Have All the Action Heroes Gone? | Nerd Much? Where Have All the Action Heroes Gone? Even now, when someone starts talking about action movies, the first actors that pop into my mind are Arnold Schwarzenegger, Sylvester Stallone, and Jean-Claude Van Damme. During the 80s and 90s, the trio of action heroes were THE hottest action stars (even if JCVD didn’t have major box office appeal like Stallone and Arnold did, but that’s a story for another day). These guys were heroes, at least in the mind of young moviegoers during their hay day. They had great fight scenes, their movies had badass explosions, and they had the cool look that added to their persona. But who do kids today have? Who are the new generation of action heroes? It looks like there’s a major void in the action hero category in today’s movies. We’re simply not getting the same quality of action movies we were getting 20 years ago. There are no Lionhearts, Predators, or Die Hards (at least, any good Die Hards). There are no badass characters riding a motorcycle in a cool leather jacket with sunglasses on, or machine gun-carrying muscle maniacs with bandanas and ammo belts. Think about the action movies we have now, can you name one consistent action movie star that has the same sort of appeal that Stallone, JCVD or Arnold did? The action movie genre over the past ten years has been generally dominated by men in masks; superhero movies reign king in the category. Not that I’m against superhero movies, because I’m not — I’m quite a fan of them, actually. But if you were to put Chris Evans in a biodome with Arnold in his prime, and told them to fight to the death, it’s undeniable that Arnold would come out the victor. Of course, that’s a ridiculous scenario that would never happen, but the point of it all is to make it obvious that the problem with today’s action movies is that there’s a general lack of badassery. 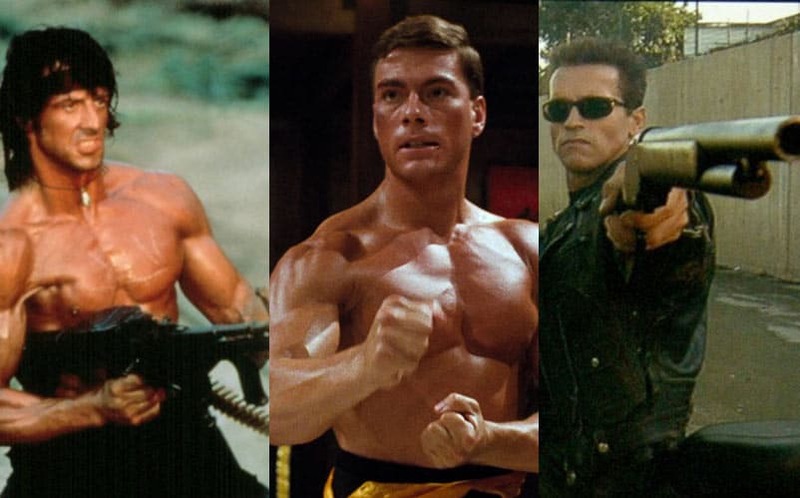 Jean-Claude Van Damme had Kickboxer, Bloodsport, Hard Target, Street Fighter (count it), and a few other great action films under his belt, a few of which we included in our list of the most underrated action movies of all time. Stallone had the Rocky movies (most of them count), Cliffhanger, Cobra, First Blood and many others that were completely badass. And, of course, Schwarzenegger had The Terminator, Predator, Total Recall, Conan the Barbarian and so many other great action flicks. The closest thing we have to an Arnold or Stallone is Dwayne “The Rock” Johnson, but his movies just simply aren’t that memorable. We’ve still got Tom Cruise chugging along and making good movies, but his stardom isn’t the same variety of appeal as, say, JCVD. I’ll also note that Chris Pratt might be on the right trajectory to become one of our generation’s go-to action heroes, following Guardians of the Galaxy and Jurassic World, but it’s too early in his career to tell for sure. As far as new leading characters for new franchises are concerned, there doesn’t appear to be a leading action hero that’s a clear frontrunner in Hollywood. And when you look at the slate of the upcoming movies of 2016, it doesn’t look like that’s going to change any time soon. Are there any action movie stars from movies in the past five or six years that you think have the same appeal? Sound off below in the comments, as I’d love to hear how wrong I am.